Visiting the Simpson residence in December will have you welcomed by magnificent crimson Pohutukawas in the foreground, putting on their best show for the festive season ahead. 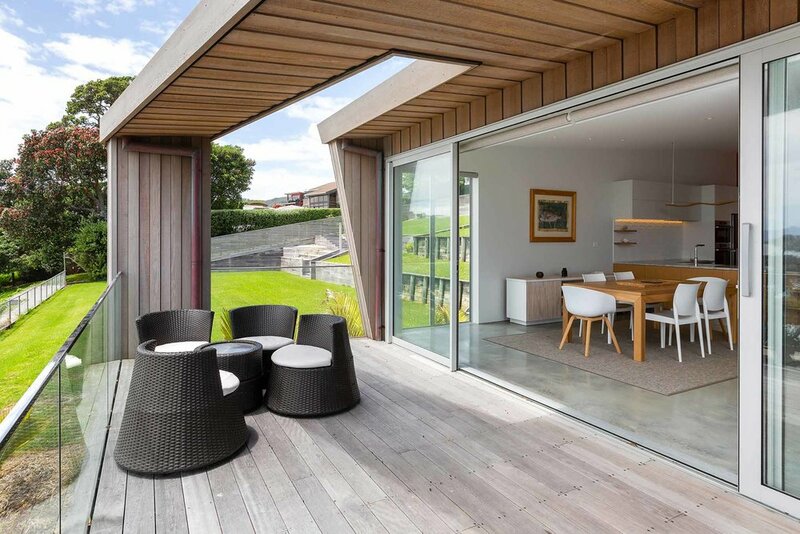 Quintessentially Kiwi and framing one of Northland’s most pristine beaches, they are the opening story to this elegant new beach house. Dishing out incredible coastal holidays to an appreciative family, the Simpson bach is a fine example of working with a challenging site on the doorstep of Langs Beach. Incorporating every ingredient for architectural success, the home is cloaked in cedar and appears to rest lightly on its narrow site. Modelled on the idea that family holidays should be relaxed, the three-bedroom home is ready for grandchildren ranging from toddler to tween, and frequent guests. The footprint has an uncomplicated open plan layout, designed to hero the view. The living areas are front-row to soak up the ocean vista, with the bedrooms at the rear and garaging, utility room and laundry on the ground floor. A mid-century bach once stood in the place of this building, and when flattened, there was no ignoring the challenges ahead. Getting out of the ground would become the primary focus for Smith Construction, calling for extensive engineering and plenty of patience! Over a 12-week period it appeared as though little was happening in a construction sense, but all efforts were geared towards getting this stunning home out of its watery and rocky base. Working closely with John Bethell of Sullivan Hall made this process seamless, with regular reporting and a great attitude to the overall timelines. We also thank our suppliers and contractors who helped pull together this dynamic build. ITM Mangawhai, Emerson Electrical, Carter Roofing, Wilson Plumbing, Polished Concrete Limited, Hugh Jones Tiling, North Glass, DC Bricklayers, Parahaki Engineering, Phoenix Windows & Doors, Dominator Doors Rodney. “The most enjoyable facet of this project has been working with a visionary client. The owner is artistic and has a strong appreciation for design. Many features of the home are his brainchild. Coming from a construction background meant the couple were really clear about what they expected from us. It also meant they were good at preempting any potential pitfalls and kept the lines of communication open. I’m proud of the results and love the way the building captures the views,” reflects Nick Smith, Smith Construction founder. Notable materials on the building include rustic cedar profiles in a mix of 18 and 28mm boards to shake-up the classic board and batten style. Other hallmarks of this high-end build include Australian hardwood paths, marble benchtops, a Bosca fireplace, bespoke bathroom cabinetry and copper spouting from Continuous Downpipes.